With the side and entry side well established, it was time to invade the backyard. Step 1 was to establish raised beds along the edges with the leftover rocks. Let's haul in more dirt, more sand, more bricks and this time lets use lawn timbers instead of railroad ties. Oh, and lets rent a sod cutter to speed things up. 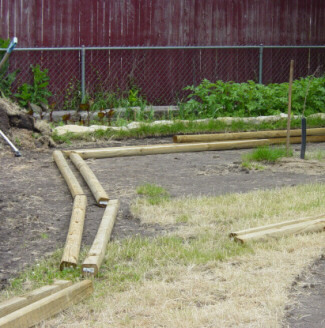 First we establish the beds and the path shapes with lawn timbers. Next we haul in the dirt and fill up the beds. Then to accomodate the supervisor, we started laying the bricks. Beneath the paths, we laid PVC pipe in order to later install our drip tubes and 12 volt lighting wire. We even planted a few new plants while we were at it. One last bed along the house. It's going to be a little higher than the rest and is in the shade most of the day. We're going to start with ferns and see how they do. These beds are wider in places so planting them will take more thinking. Looking around we found a need to store our stuff. So, we stopped digging long enough to put up a little barn.